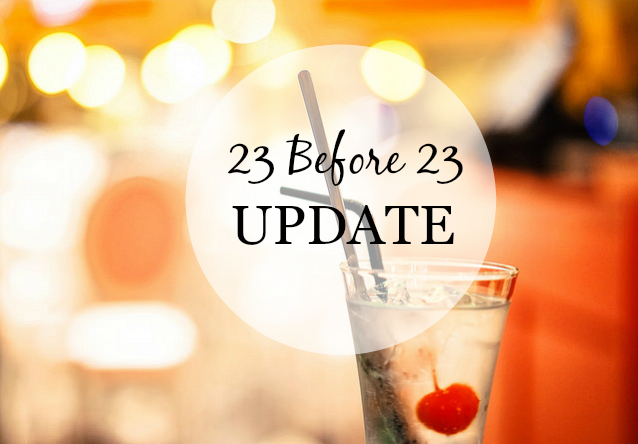 It’s been a while since I talked about my 23 Before 23. In my last post on the subject, I made a list of 23 things I wanted to accomplish before my 23rd birthday. Since my birthday is now only three months and one day away (June 17), I thought it might be a good time to update you on my progress. Long story short – I haven’t accomplished as much as I’d hoped to by now. I could really use some help. Read 23 books. I think I’ve read about seven so far. Eek. Pay off my cat’s veterinary bills. Make a dent in my student loans. I need to make this goal more specific somehow… Any suggestions? Host a dinner party. Oops. I actually forgot about this one. Get published. Working on it! Join a club. I’ve signed up to volunteer with the local theater. Fingers crossed! Comment on at least one blog post per day. I need to get better about this one, too. Trade guest posts with three bloggers. One down, two to go! Mentor someone. WHO NEEDS A MENTOR?? Get a new laptop. Found a MacBook Pro for pretty cheap. I just need to save some money. Go ziplining. I found the place, but I don’t want to go alone. Try out for a play. See number seven. Consistently post three times a week. Contact one writer, blogger, or person I admire per week. Compile a blog directory. Ava Jae’s blog directory is absolutely gorgeous and an excellent idea. Support my favorite authors and beloved writing tweeps. Make my bed every day. Why is this so difficult? Visit New York again. Except I don’t really want to do that anymore – I want to go somewhere new instead. So, there it is. I have my shortcomings. I’m running out of time to accomplish all these things, and I’m going to need help and support from all of you. Please keep me accountable to this list! If you could ask me how I’m doing with it every so often, I would love you forever. Well, more than I already do, anyway. I’m also thinking about starting some kind of club where we all try one new habit or routine each month, like a thirty-day challenge. Let me know what you think!